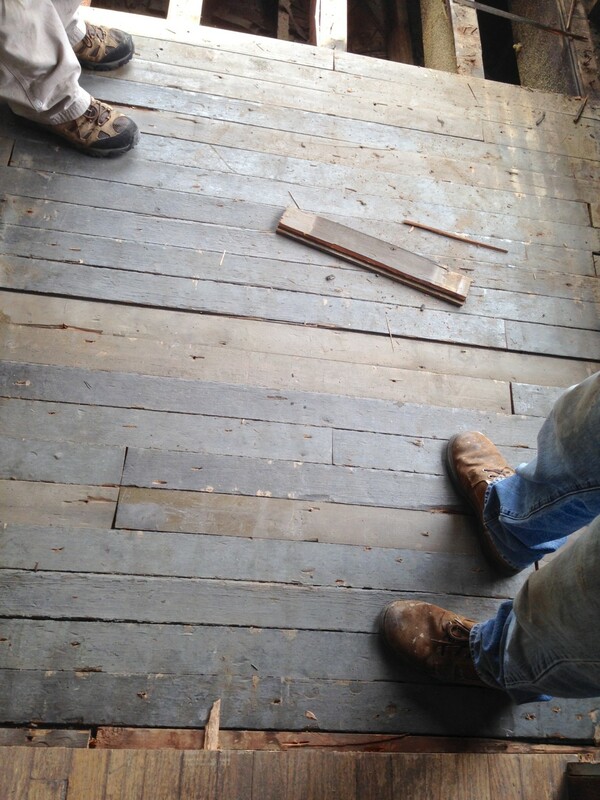 In removing the non-original flooring to the second-floor porch, we discovered that there were two layers. The top layer was oak, and this was contiguous with the adjacent Sewing Room. Under the oak, was this pine floor. The pine floor was clearly salvaged, and roughly installed as a subfloor for the oak. Once both floors were removed, I discovered a real mess under. In cleaning the mess up, it was obvious that most of it was bits and pieces matching the pine flooring. The original floor was ABOVE the oak/pine flooring, but was removed at some point. And I now think that the original porch flooring was the pine. This was roughly removed, it appears, and bits and pieces of it fell down to the ceiling below. Most of it though was re-used as a subfloor for the new oak flooring. In 1894, the pine would have been installed tight, and because of the built-in slope, would have funneled water to the drain in the SE corner (extant). The floor was painted (gray) as additional waterproofing. Because I had no idea of what the original flooring was, I recreated the original floor level, but out of waterproof plywood. This I will sand and paint. Even though I now think that the original floor was T&G strips of pine, painted, I am OK with the plywood floor for now. Later, I can remove it, and install a T&G floor. I worry though about how to keep such a floor waterproof. Over time the pine will move and shrink, and this will create water damage down the road. I am loath for create such a situation, so might leave the plywood. With the plywood painted, and covered with an outdoor rug (sisal?) and with some period-correct porch furnishings, the floor will barely be visible in any event. I am all for preservation. But how does one preserve something which is lost? Guessing always makes me nervous. In such an event, I default to making an OBVIOUS update. But…but, I am now 97% certain that the pine flooring WAS the original porch floor, although relocated and re-used in a new configuration. The original flooring was way too damaged to re-use. But I could have it matched. Even though this would likely cause damage to the house later. But I like the solution. 15 Responses to A Porch Floor…maybe. I think for something like this, the plywood is fine. If you happen to find the extra money down the line (ha – that was a trick, there is never extra money if you are fixing up an old house! 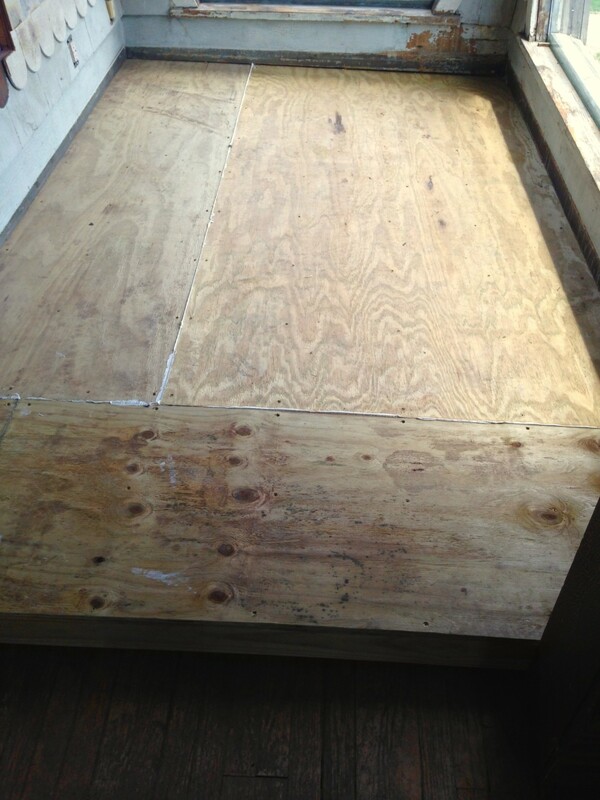 ), you could lower the marine plywood to be the sub-floor, waterproof it, and then put the pine tongue and groove on top. I liked your thought process! I agree with Derek. Time for a glass of wine, two wicker chairs, and listening to your favorite music as dusk turns to dark! Your conclusion is best for the summer of 2016 ! ! Ross, I have a similar, though less grand porch we call the Juliet balcony. Shingled side walls, and access through a bathroom window. 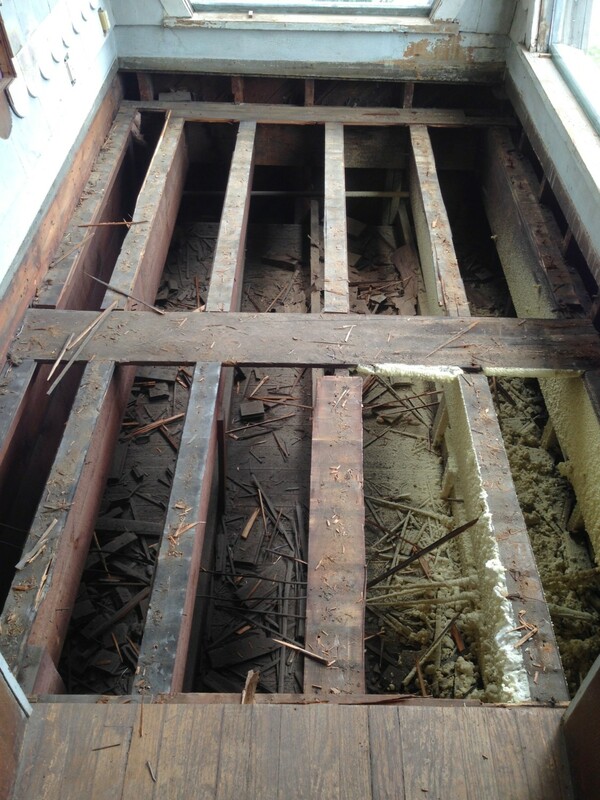 The subfloor is tongue and groove pine, with soldered tin roofing on top. An important note that may apply to your floor; there is a channel about an inch lower than the floor around the outer perimeter that is lined with the same tin (continuous) from the flooring. It’s this channel that feeds into our drain. I suspect your porch gets less rain than ours, so that detail may be overkill. Have you sat on the porch through a few rain storms to observe how the weather hits it? what an awesome idea! To sit out on that lovely spot in a rain storm! Like Meg, I suspect an original terne metal top surface because of the drain, and the leakiness of plain t & g even when painted. Or painted canvas. At risk of being thought an old FOGI (Full Of Good Ideas), maybe tread-surfaced EPDM which can be painted any color with elastomeric compatible paint, or vinyl membrane products like Dec-K-Ing? They also come in colors and are waterproof. You make a great point about how can one “restore” lost elements, when the restoration is conjectural at best and technically deficient at worst. I coated a sieve-like exterior terne roof with built-in gutters with Preservation Products Acrymax, an elastomeric product, years ago and it looks to see me out! I will say this – we did a tight tongue and groove pine on our porch, and it’s done great through a couple of winters and plenty of storms. The only wear is to the steps and the edges – anything under cover is SO perfect still. And you have so much cover. I think if you did a waterproof stain or paint, and maybe even a marine varnish if you’re worried, it would be fine. But plywood works perfectly, too! I’m not trying to sway you, just letting you know how mine worked out. I would totally do it again! Oh no! That’s awful. Truly – we didn’t do anything special to it. We did stain it, and didn’t paint it, using a high quality exterior stain from Sherwin Williams – three coats. Anything that’s under cover is pretty perfect. The steps and edges have some wear / warp. We used all new T&G flooring from a local lumberyard. That’s a possibility – ours was installed in late July, and ours stays pretty covered. I hate this for you! 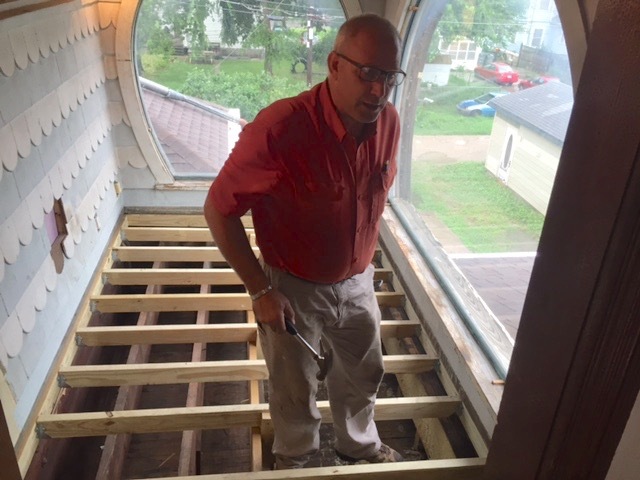 Ross, I didn’t see any flashing at the edges of the porch which would go up the wall, under the shingles and on to the subfloor, under the finish floor. Is that a plan to put that in before you put on a finish floor? It does not appear that the original floor was flashed. Nor do I think it needs it. The floor has a good slope, and a drain at the low end. I will waterproof caulk the edges. If all goes well, all should be well. These porches before air conditioning were often refereed to as summer sleeping porches, made to catch the breeze. They often had a day bed on them with rattan screening for privacy. Role blinds or folded screens. Enough to block peoples eyes but to allow the breeze!!!!! Why did you raise the floor of the porch? I would have made it even with the sewing room. I thought you were going to make the window into door for access to it. The raised porch floor will be a trip factor if you put in the door. Seems to me, original or not, a bad idea is a bad idea. The porch floor is now where it was originally. 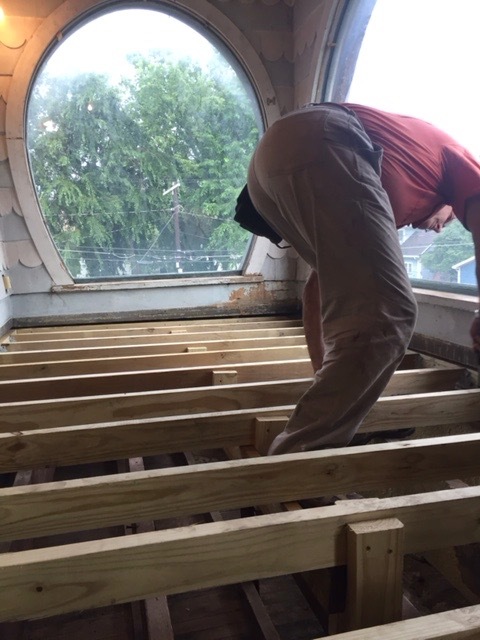 The floor is sloped and connects to the original drain in the corner. I will also be reinstating the original window and window sill. So, one will be unaware that the sewing room floor and the porch floor are different heights. But, the window itself will be hinged like a door; it will swing open, and people can step over the low sill and out onto the porch. Quirky features on an old house are good things!